Disclaimer: The resale of alcohol is illegal, without proper license, and I am in no way encouraging it. I also have no problems with the current market, buyers, sellers or prices. This article is just an observation of a free market at work which I find fascinating. The only thing I’d point out is that according to the lawyer we conferred with before launching Bottle-Spot, the resale of distilled beverages and wines for non-commercial purposes is not illegal. According to 27 U.S. Code Section 203, it is unlawful to engage in the business of producing, importing, exporting, selling or offering to sell distilled or malt beverages or wines, and for anyone to purchase them at wholesale. The most important component is the summary, which states the law is intended to enforce the 21st amendment, which prohibits violating any state law in inter-state commerce. It also states it’s intention to protect tax revenue, which should not be an issue unless someone is buying at wholesale illegally. Because of the above, we don’t believe that reselling alcohol as a hobby is illegal, so long as it is a hobby and not a business (the IRS sets those rules). If people are still concerned, they can restrict their dealings to intrastate (so long as it’s legal in their state), because the above law applies only to interstate commerce. Why are bottles of Pappy Van Winkle so expensive on the secondary market? The bottles retail for $79 and are reselling for $500. Is the bourbon market a in a bubble? Expensive whiskey bottles are nothing new and neither are the high prices on the secondary market. What is unique about the current bourbon secondary market is that these current releases are sold for 5 to 20 times the retail price. Normally, prices like this are reserved for bottles no longer in production or from a distillery that no longer exists. This is not the case in the current market. 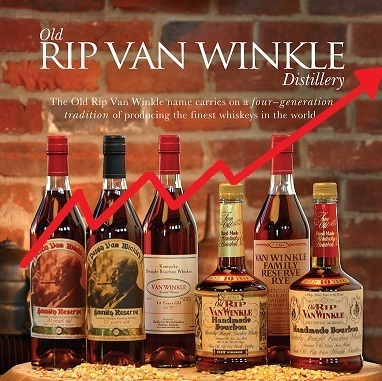 A 2013 Old Rip Van Winkle 10 year bottle consistently sells for $150-$200 with a retail price of $39. I believe the secondary market has benefitted from the retailer’s short comings. What is the bourbon secondary/black/grey market? The secondary market was born out of the increased demand and shortage in supply of bourbon. Bourbon collectors and drinkers have organized in multiple ways to exchange bottles. First, eBay was a substantial marketplace for collectors until alcohol sales were shut down. Next, there was an active group on Facebook called the Bourbon Exchange. This has also since been shut down. There still remain several groups on Facebook for buying, selling, and trading bourbon bottles. Craigslist is another popular option. However, in my opinion, craigslist is still synonymous with scams. The best option seems to be Bottle-spot.com. This site has verified emails and other safe guards in place to ensure quality trading. No matter the outlet the secondary market is thriving. In a typical market, equilibrium is reached by balancing supply, demand and price. The bourbon market is experiencing the exact opposite. It’s currently in a state of disequilibrium because demand significantly outweighs the supply, which drives up price. Two parties that have exploited the secondary market are the retail gougers and scalpers. Retailers are hiking the price of Pappy because of the volumes of calls received about its release. They then see what the bottles are selling for online and follow suit. Scalpers in turn grab every bottle they can within a 500 mile radius. They then resell that same bottle at a much higher price on the secondary market. A third group that should also be mentioned is the opportunist. This is a consumer who grabs an extra bottle when he can because why not cover your bourbon habit by selling a spare bottle? The amazing thing about these three parties is they have stepped in and stabilized the bourbon market where the retail market could not. What’s next for the bourbon market? We have to remember it wasn’t that long ago distilleries had to use gimmicks to sell their bourbon. Julian Van Winkle tells the story of how they used branded decanters to sell their bourbon, my how the times have changed. The bourbon industry is now playing catch up in a major way. In most markets the answer is simple, increase the supply. When your product takes 10-23 years to make this is not a viable short-term solution. Buffalo Trace (and most distilleries) has increased their production but most of this bourbon is only 4-6 years old. The way I see it is there is only two short-term solutions. One, the distilleries and brands increase the retail price to cut out the scalper. This solution benefits the distilleries but hurts the consumer and cuts out the margin of the scalper. (Hypothetically, who knows? Maybe the secondary prices will rise congruent with retail pricing). Two, do nothing and wait until the hype machine runs out of steam and demand dies down. Number two is more of a risk because there is no telling when demand may die down. We can only speculate as to what will come of this massive demand we have created. Personally, I believe the only solution is for the distilleries to raise retail prices. Compare the scotch market to the bourbon market. The quality in a $30 bottle of bourbon blows a $30 bottle of scotch out of the water (don’t kill me scotch fans). Historically the demand for scotch was much higher, however, the current spirits market is trending in favor of bourbon. We’ve already seen NDP’s (Non Distiller Producers) use secondary pricing in their Limited Editions. Angel’s Envy released Angel’s Envy Cask Strength bourbon for $200. Michters released a sour mash whiskey for $3,000(I assume these are still on shelves). Whistle Pig released Boss Hog which was a 12 year old barrel proof rye retailing for around $150. The point is consumers are proving they will pay premium prices for quality bourbons and American whiskeys. Distilleries (the ones that make, age and bottle the bourbon) should be reaping the benefits of increased demands, not some guy that stands in line for a few hours and immediately resells the bottle. Buffalo Trace Antique Collection prices varies greatly by bottle. Sazerac 18 and William LaRue Weller are on the high end, Thomas Handy on the low end and George T. Stagg and Eagle Rare 17 somewhere in the middle. Want to build your Whiskey Library and wishlist? Respectfully, this analysis suffers from some fundamental errors — namely, confusing “supply” with “quantity supplied” throughout and inaccurately graphing the supply and demand curves that reflect the current market conditions. Based on the issue of shortages in the short and medium terms — which you HAVE correctly identified — the supply curve should be nearly vertical, as even at higher prices, there is not a whole lot that producers can do to bring the high quality aged whiskey to market that consumers are demanding. And we’re seeing what can be done — for example, Buffalo Trace cannabalizing Weller 12 and Eagle Rare to create more of the PVW bottling — but even that is a substitution effect, and there’s no real substitute for age, which is what is demanded. Also, I agree with you about raising prices, but I think you’re missing another solution — which is distillers selling futures on the market (both on the retail and wholesale level), in somewhat the same way that is done with Bordeaux. Given the much longer aging process and lag time for Bourbon, though, the products would have to not be offered on futures for a while — E.g., something like 9 years into aging for a 12 year whiskey, 12 years for a 16 year old whiskey, and 16 for a 21-year old whiskey, as I don’t think consumers have the patience to wait much longer than that. But it would provide income to the distilleries substantially before the release while also hedging against a collapse in demand for their products. Completely agree. I replaced the term supply to make it simple rather than trying to explain quantity supplied. I probably should have included a note about prices in which all other things remain the same. Quantity supplied can be a tricky thing and I felt like I was better off not getting sidetracked explaining an economic concept but rather just focus on the purpose of the post. The supply curves used are not based on the current market they’re just stand examples of supply and demand. In response to your other comment, I think it would be great if bourbon offered futures. If I can trade in pork bellies why can’t I trade in bourbon barrels! Speculation is driving up price and this will eventually cause the price of Pappy to fall. You can tell its speculation because there isn’t a coherent price marker for Pappy 23. Prices range from 1-3.5k, meaning the market is searching for equilibrium. Equilibrium being the situation that arises when there is a fixed price & supply available at this price, for which demand is matched. I’m not saying that it’ll drive prices to retail but Pappy won’t be worth what people are asking for it today. Flippers drive this secondary market but flippers aren’t a business. Flippers can’t just eat up the overhead cost and wait for the right customer to walk in through the door. Having Pappy just sitting around that you intended to sell for vast sums incurs you a rent cost just by having it sit there. The money is stuck there, money you could use for other things, until someone purchases your bottle. Flipper’s rely on fast money and red hot demand to make that money. The problem is there are too many of them. Meaning that if everyone wants to sell the 23 for over 1k only very few people will be able to afford it at that price or want to buy at that price. At the moment it’s a sellers market. Eventually some of these flippers won’t be able to bear the cost of holding such a valuable asset for so long and not have it sell. Eventually $800 sounds reasonable. As more flippers see this Pappy move the market in general will start to turn to a buyers market. Not saying the situation is there yet, but give it time, more pappy releases, and more suckers buying into it like these are blue chip stocks, storing 10+ bottles etc.. When they can’t afford for it not to sell, fast, the market will strain. I focus more on Pappy 23 since that is the bottle I see the largest price fluctuation for. 10-12-15-20 I largely see stabilizing already within a +/- $100 range. Solution for me to end the Secondary market is to increase the frequency of release. Pappy was once released twice a year. More bottles on the market means more supply which can at least alleviate some of the excessive demand. You mention that Bourbon needs time to mature and it does but, for me this can easily be changed with some tinkers. When Pappy switched from Stitzel-Weller to BT, Pappy for awhile was SW stocks, then it gradually moved to a blend of SW + BT bourbons, to some of the Pappy now being completely BT product ie Pappy 15-12-10. Jason Pyle wrote about this in 2011 and it was mentioned in an entry on K&L’s spirits blog as well. Since that writing I haven’t been able to find any info regarding what is the status of BT’s stock of 20-23yo aged Bourbon. They might or might not have more/less supply than did SW. What is the status of any SW stock they might have left is also a mystery. So we really have no way to evaluate how quickly they can affect supply. What is the proportions of SW to BT in 20-23 yo Pappy today is also unknown. Simply I don’t see why they couldn’t find stocks of older Bourbons from other distilleries and create a blend to increase supply much like they did with SW+ BT whiskey. Quality of the product would largely depend on the skill of the blender but it could be done and I’d say unless you have several years of Pappy releases stored away and were willing to open them up to do a side-by-side tasting, 99% of Pappy buyers today would hardly notice any tangible change. If it was done, I’m sure with a skillful blend, we wouldn’t even detect a difference unless it was disclosed by JVW or BT. I mean let’s be honest, if BT did do a blend to create Pappy would they even be transparent enough to tell the public? As is we don’t know what is the proportion of Pappy being produced at BT nor what is the origin/composition of the bourbon in older Pappy bottlings. We simply assume it all comes from Buffalo Trace. But the average customer/flipper/trophy hunter cares much less about such technicalities. Imo as long as they could ballpark it in terms of taste & quality they could make a blend, hardly anyone would notice a change, and it would still sell like it’s gold. Pappy now is big enough as a brand name that even if there was a slight dip in quality the public would still come in for it. Cutting a products quality is nothing new. You mentioned scotch and some of the best scotch whisky on the market today is produced via creative methods to increase supply and cut cost. In essence this would be a way for BT to take out the flippers, increase profits, and supply everyone with more Pappy. It’s not the happiest of solutions but it’s realistic. I have an un openedbottle of old rip van winkle from 1993 10 year any idea what’s it’s worth? Unfortunately, the above comments are wrongfully assuming that there is a true relationship between price, value, and quality. This erroneous assumption made by those not producing the products has driven the price up. Called cognoscente dissonance. the purchaser wants to believe the product is better to justify the ridiculous price. Those of us producing the bourbon just smile as the balloon will pop. In the meantime, we are today producing roughly two times the current market meaning we think the demand for bourbon will double by 2018. This artificial demand has driven the price of new oak barrels from $115 to almost $200. Keep in mind, we are making and aging bourbon now what we think will be consumed in four or five years. At corn prices today of $3 a bushel and rye prices at $6 dollars a bushel with average yields of about 5 proof gallons a bushel, the raw material per case are about $2 per case, plus distilling energy about the same. The big guys are producing a proof gallon of 4 year old bourbon, including the barrel, at about $5.00-$6.00 . It takes 1.9 proof gallon to make a case of bourbon 12/750 ml. Losses do happen so that the cost of the regauged proof gallons, increases about 50 cents a year. In other words, a 6 year old might go up a $1.00 per proof gallon or $1.90 a case. ( 10 cents per bottle) . The spirits business is Disneyland for Adults. We love to buy the stories that the media is selling. And the media itself does not know the real information. Bottom line, the difference in cost between a good 4 year old bourbon and a not so good 12 year old, woody bottle, is about a buck, maybe two. The selling price is as much as $75 at retail. Why criticize the secondary market. Nobody needs to pay those prices and the only ones that do are real fools. It is always easy to separate a fool from their money. The trouble with blending is that the age of the youngest in the blend is what age goes on the bottle. I am a producer in the bourbon business and it is near impossible to buy aged , over 6 years, bourbon from anyone. The current price on the “open” market for 6 year old bourbon is about $1300 a barrel. That barrel will yield maybe 22 cases, depending on how and where it was aged. That runs out at about $60.00 a case or $5.00 a bottle. Many of the big distillers are holding back bourbon now to age it longer in hopes that the bourbon business will become like the scotch business with age everything. However, you can’t get too rich on selling 100o cases of 23 year old at $450 a case. You can get rich on selling 5 million cases at 200 a case. Keep in mind that the cost of a 15 year old is not much more than a 4 year old. Volume in the long run is everything. If that was not the case, and knowing there is a shortage, Jack Daniels would be selling their regular Jack at $25.00 a bottle. Why irritate your customers for short term gain. Jack Daniels will be making money long after Pappy becomes not cool with a price at $25.00 a bottle, or less. I have several bottles to sell. Let me know if you have interest. Would love to try and get a bottle of the 15 if you have one. Thanks for the note! L. Schukar, I’d like to buy a bottle off you? Greetings!! Do you still have bottles of Van Winkle for sale? what you guys are missing the point on is there are a handful of collectors of pappy who own 200-500 bottles each who are in no way incentivized or in a rush to sell since they are very wealthy and will continue to buy up the supply that is out there that is cheap. A handful of guys over grabbing some bottles won’t put a collective dent in the demand. Where are these guys buying from? The people at bottle spot are so full of crap. And I suspect they will get shut down in the future. What is the difference between them and the Facebook group that got shut down? Their interpretation of the law is one thing, but until someone makes a fuss, they will stay open. And it is sites like those that encourage the crazy increase in spirits on the secondary market. Talking about how Pappy 15 at $500 is such a great deal! yeah, right. As you can see by my name, I am clueless about bourbon. My brother wants a bottle of Pappy, why, I have no idea. I found a 23 for $500 thru the “secondary market” as you guys all refer to it. Is this a reasonable deal, or am I wasting money? I’m assuming he doesn’t want to drink it, he just wants to “collect” it. And just to prove how clueless I really am, does ANYONE actually drink the bourbon? Is it any good? $500 for a 23 (while it sounds crazy) is a really good deal. Most are going for $1,400. It’s very good bourbon. But there’s also other $200, $100 and $50 very good bourbons. Most are probably just collecting dust on shelves as a display piece. Thank you, this helps. My brother is turning 60, I guess he’s worth it, and it’s good to know it’s a great price. It’s a friend who has 3 or 4 bottles of the 23 and he’s willing to part with one $500 (for me). He said he has all the years, just bought extra 23’s… just like the article said. I work at BevMo and was just made the AOR (Area of Responsibility) of Spirits and my knowledge is limited to what’s in the store and what I’ve tried (which isn’t a lot with respect to Bourbon). I’m trying to read up more on Bourbon and Scotch so I can help the customers that don’t drink bourbon or scotch, they are purchasing gifts and usually request guidance. Thanks again for answering. Me again, I found a 15 year, this guy wants $375. I know that’s a lot compared to the $500 for a 23, but based on the $1,400 most are going for, is $375 good for a 15? Thank you again. “This third edition of William Heavenhill is an extremely limited and unique offering. It has been aged for 132 months under the careful supervision of our Master Distillers, Parker and Craig Beam. Less than 12 barrels of this outstanding bourbon were produced. Sold for collectible purposes must be legal age. Shipped at buyer’s risk…$20 I also have a Elijah Craig 23year, close to impossible to find. I have 2 of each and am willing to sell one of each. $220 for Williams Heavenhill red label bottled in bond. $375 Elijah Craig 23yr single barrel! I have one bottle each of the 12 year Lot B, 15 year, 20 year, and Family Reserve Rye, that I bought in 200 and 2007. I believed, at the time, that they all still held bourbon distilled at the Stitzel Weller distillery — is that true? Is there a way to prove that the bottles are from that time period? I know when I bought them, but how do I prove that to a potential buyer — and would that make any difference anyway? I recently did some research on this as I have a pvw 15 in my collection and noted the following, correct me if I’m wrong please. Bar codes were introduced to pvw bottles in 2011. The web address on pvw bottles was added in 2004. The 15 was changed from Stitzel-Weller content in or around 2011. Another point, not sure about though, pvw 15 was originally a 700ml bottle which I believe was changed to 750ml in 2011 ish. Or is it 700ml bottles for UK export and 750ml bottles for USA market. Hope this helps for dating. If it is wrong in any way, please advise because it is so hard finding real facts out there about pvw. I see the prices in this article from 2013 What are the prices now in 2015? I scored myself a 2015 bottle of William Larue Weller yesterday! I made friends with some of the employees over the years…so they looked out when an extra bottle of the BTAC became available. Nice! I also paid retail for it which was $79.99 plus tax…so, all together it was $82.67…not bad….lol… My husband and I will enjoy it over the holidays with family. Try bonhams in California. They usually host two whiskey auctions per year that are some of the better in the US. Is wine-spot’s interpretation of the law actually legal? In Austin,Tx. at Vince Young’s Steakhouse u can get van winkle for 15 a glass. I would guess that is 1 shot. that is the 10 year old. FYI a bottle of 12 year old Rare Breed is 40 bucks, and will warm your toes, and it is awesome bourbon. Drink up.